So, I think I’ll start a new feature here at The Scottie Chronicles called “Surf’s Up!” As in, I’m been surfing the Internet to find fun and useful links so you don’t have to. Today’s installment features Cute Overload. I’ve been following this blog for a while now and, frankly, I can’t get enough of it. It’s all about animals. Pictures and movies and stuff like that. Since I’m cute, I’ll have to get the peep to submit a picture of moi sometime. Check it out. Cute Overload. You won’t regret it. It’s where I share stuff I’ve found on the Internet with you. Funny things. Cute things. Helpful things. It won’t be weekly or daily, but I’ll try to do it at least once a month or so. Cute Overload. Oh boy. Betcha can’t visit just once! 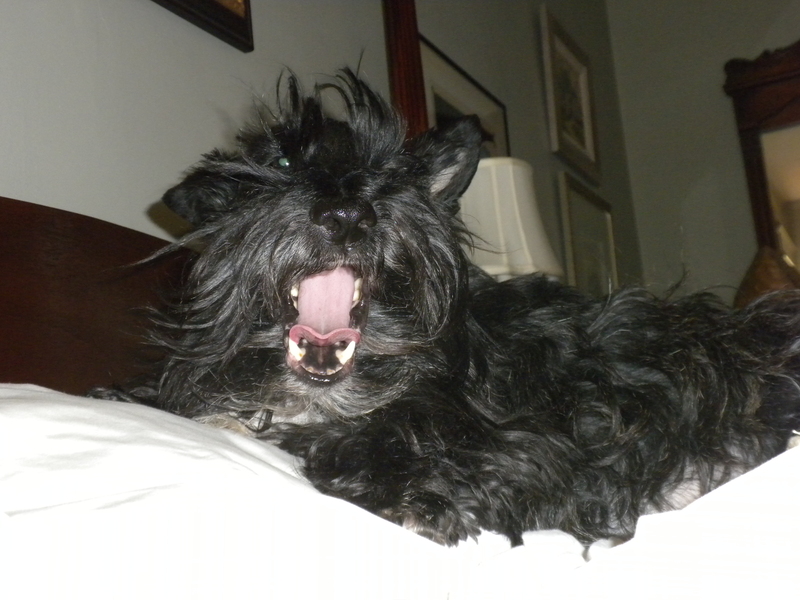 This entry was posted in The Scottie Chronicles and tagged animals, blogs, Cute Overload, cute photos, Internet, pets, Scotties, Scottish Terriers. Bookmark the permalink. Those goats were pretty cute and funny. Great idea Stuart. I love those goats. If you follow Cute Overload long enough, or scroll through the posts, you’ll find some “stampeding” kiddie goats, too! Nice, but not nearly as cute as Stu. That does it. I’m off to find one now…. The baby elephant! Soooo cute. Thanks for the link. Oh yes! I love me some elephants. Big or small. I don’t care. Hey cute knows cute — am I right?!! Cute Overload is great but it’s missing one thing…you, Stuart! Have your peep talk to their peeps and get you on there! You will be a Scottie sensation! Love your BIG yawn, Stuart. We Scots have BIG mouths, don’t we? And I needed to let Dui know that, but I missed Ranger’s tips for Dui. So, Dui, since we’ve got big mouths, and big teeth, don’t forget NOT to bite the peeps that feed you. How’s that? Aww great idea! and Cute overload is one of my faves too! Great site! You would fit in great Stuart! Love the pic of you today! Shelby said that you are cute enough for her. She saw one of those opossums dead in front of our mailbox and doesn’t want to be reminded of the terrible sight and think. My momma has been reading Cute Overload for years and years now. That is so NOT what I was thinking Surf’s Up was gonna be, but what a pawsome idea!!! We’re loving your new theme days Stu! Have a pawsome weekend buddy. I thought it were just gonna be a post featurin’ pics of you, Stu… cuz ev’ry time I sees your cute face, I gets a case of “cuteness overload”!! I think that’s a fab idea!! Cute eh? I should send them a picture of cute little me!